Beatles Southport Odeon Concert Poster (UK, 1963). 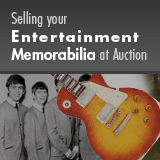 Never before offered at Heritage is this especially rare Beatles concert poster. With Gerry and the Pacemakers opening, and BBC filming them for inclusion in a documentary, the Mop Tops played two shows, six nights in a row in August, 1963 at the Odeon in the seaside town of Southport. This version of the poster, with pink, yellow, and red graphics, and featuring photos of the Beatles and the Pacemakers, measures approximately 10" x 15", and is the only one of these we've ever seen! In Very Good Minus condition, with minor restoration, damp staining, tape marks, rounded corners, creasing, and soiling evident, as well as unknown signatures on the verso.